Summertime in the South means one thing for sure- hot, hot, hot! With that heat, though, comes some of the most amazing tomatoes imaginable. In our neighborhood in Nashville, that is call for celebration and that’s just what we do. The Tomato Art Festival gets bigger every year – in size and popularity. I decided to honor it this year with a new tomato pie recipe. - 1 Dough Ball (remember to never use store bought please). Preheat oven to 425. Roll out the dough, form into a pie plate, and scallop the edges. Place in the freezer for about 10 minutes. I find this helps the edges keep their form a little better once you place the pie in the oven. Cut the tomatoes in half (or if using larger ones, cut into smaller pieces) and mix with 2 Tbsp corn meal, salt, pepper, and chopped herbs. 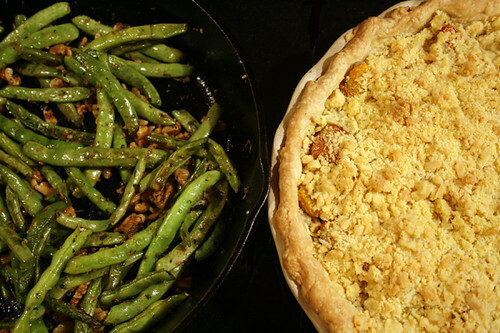 Place in pie shell. 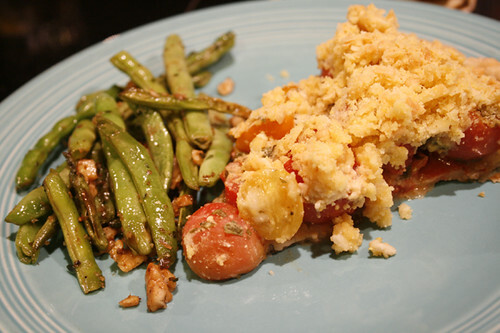 Mix the next few ingredients with your hands or a food processor to form crumbs and cover the tomatoes. Place the pie in the oven for 15 minutes, and then lower the temperature to 350 for 30-35 minutes or until golden. We feel so lucky to have tomatoes in our own garden and so many friends with extra tomatoes to share. Sometimes it gets tricky figuring out how to use them all before they spoil since we never refrigerate the fresh ones. 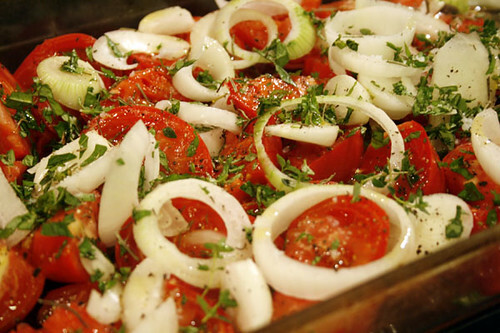 One of my very favorite and easiest ways to use up all those tomatoes in the summer is to cut them, place them in an ovenproof dish with cut onions and sometimes garlic, sprinkle with olive oil and fresh herbs and roast them up in the oven. I then either place them in a jar in the refrigerator and use them later in the week- on top of salads, in eggs, on sandwiches, on top of chicken or fish, etc.- or I puree the roasted tomatoes and onions to make the world’s simplest pasta sauce. It is my favorite, so fresh and yummy! We recently spent time at a family gathering in the North Carolina mountains for a long weekend. My cousin Johnny is a farmer and brought us some amazing produce to take home with us from his garden in the Virginia hills. Stringing the green beans reminded me of being a young girl, sitting around my Nana’s living room in Virginia with all my great aunts, Nana, mom, and my sis with bowls in our laps and knives in our hands collectively stinging and cutting pounds of green beans (Half Runners, those were THE only variety to ever eat according to my grandmother and mom) while talking about the old days and hearing stories about everyone in the family and the small community where my mom grew up. This memory is a big part of who I am and one I cherish. Hopefully they wouldn’t be too disappointed in me not cooking them the “correct” way but I came up with this recipe, below, which was great served with the Tomato Pie! Place the pan on the stove and heat to medium high. Place half the butter and the oil in the pan. 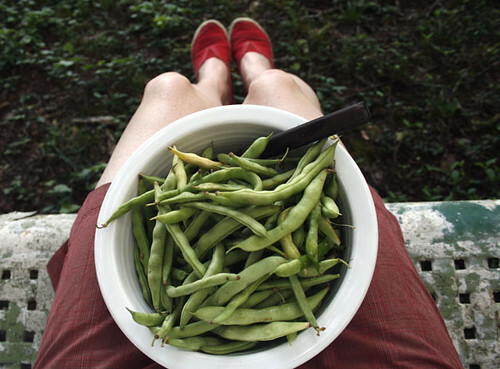 Toss the green beans in. Cook, stirring, until the beans begin to soften. Push to the side. Add the remaining butter to the middle of the pan and then toss the walnuts in. Cook for a couple minutes and then stir together with the beans. Toss the zest and the thyme in. Stir well to incorporate. Salt and pepper to taste. Serve hot. Put an egg on it! 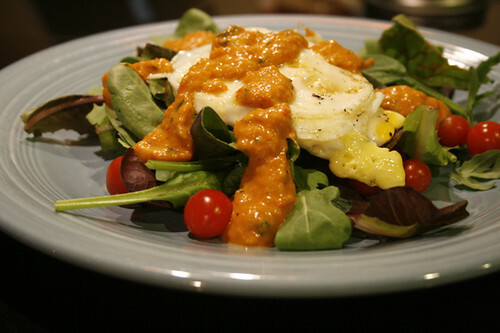 I was thinking about the new trend in many fancy restaurants lately to put an egg on top of nontraditional egg dishes. This is popular in many Spanish dishes, as well. I came up with this simple salad below which incorporated little tomatoes from our garden and some roasted red and yellow peppers. Cut the peppers and onion and place in an ovenproof dish. Drizzle with olive oil and roast in the oven on 375 for about 30 minutes (you just don’t want the peppers too charred, just slightly roasted). Place in a food processor or mini grinder. Add the oil, vinegar, paprika, basil, and salt. Thin with a little water if necessary. 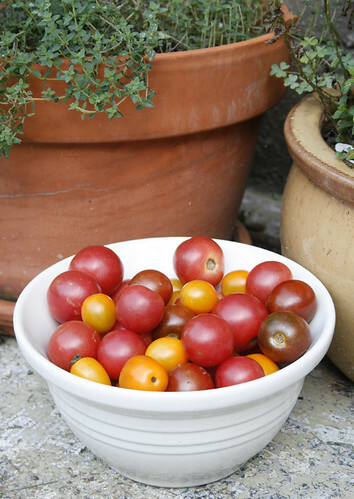 Arrange the greens and tomatoes in a bowl. Fry an egg and place on top. Drizzle with the vinaigrette. So far, none of this has anything at all to do with the title, “All I Want Is a Honky-Tonk” except that two things Nashville does really well is grow some of the best tomatoes in the world and give you the best Honky-Tonk experience ever! Lower Broadway is a street in downtown Nashville lined with bars that feature live country music, all the time. Robert’s Western World and Layla’s Bluegrass Inn are my two favorites. When we first moved to Nashville, we only knew two people in town and had no jobs except for Grant’s guitar gigs which were in the honky-tonks and were 4 hours long, so I would go along and sit and watch people and listen to music. I’ve clocked too many honky-tonk hours to even count at this point and I still enjoy it every time. For the last year, Grant has been playing for a woman named Sarah Gayle Meech who has regular gigs at both Layla’s and Robert’s. Sarah always has top players in her band. She does an excellent rendition of all my favorite old school country songs but she also writes some good songs of her own and just this week released her first full length album titled, “One Good Thing.” She has assembled an all-star cast of musicians for this album which features twelve songs that she wrote. 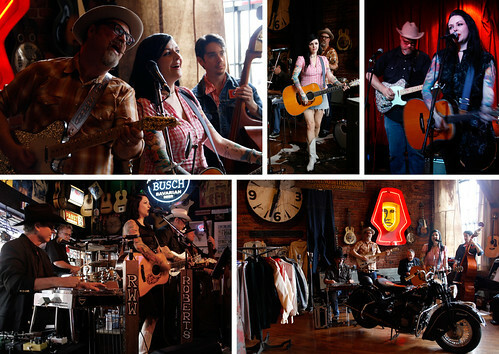 For all you in the Chicago area, she’s taking the honky-tonk on the road. You can catch her show at Joe’s this Friday, August 17th, opening for Stoney LaRue. Be sure to buy one of her new cds or you can do that now here. Oh, and that title, “All I Want Is a Honky-Tonk” is track number 3. Have a listen! It’s one of those songs that gets stuck in your head and makes you real happy. Sarah Gayle Meech and The Meech Boys cd release party at Layla’s Bluegrass Inn on Lower Broadway. August 8, 2012.